Heavy rain and thunderstorms are wreaking havoc across China, with floods along major rivers destroying bridges, blocking roads and railways and forcing thousands of residents to evacuate, state media reported on Saturday. [post_ads]Weather authorities are forecasting more downpours throughout the country on Saturday, with floods and landslides expected in the southwestern province of Sichuan. 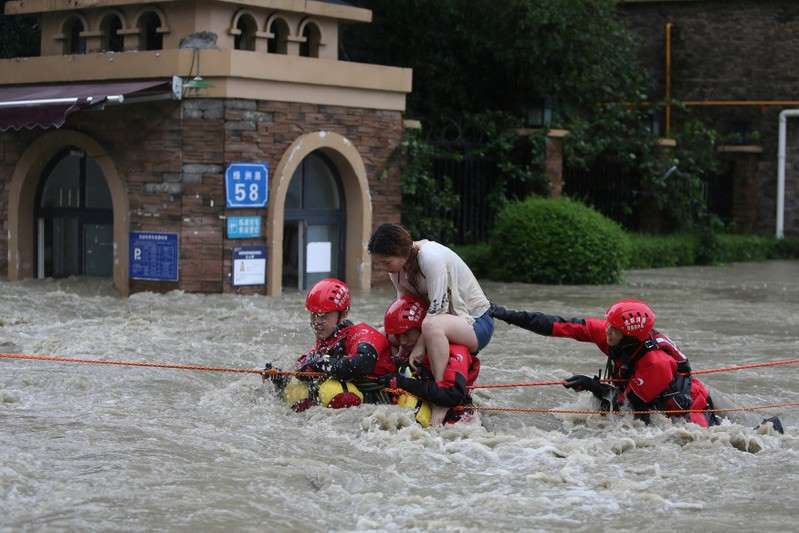 Heavy rain and flooding hits much of China this time every year, often with hundreds killed, but the number of casualties this year has been relatively low, at least in the early summer, with one province reporting 12 dead and another three. The National Meteorological Center said rainfall could exceed 80 mm per hour in some regions on Saturday. It also warned of floods in the northeast and called on authorities to halt outdoor activities and watch out for collapsing structures. The flood-prone Yangtze river, which runs from Yunnan in the southwest to Jiangsu and Shanghai on the east coast, has seen a massive increase in water volumes, causing flooding in many of its tributaries and bringing water volumes in the giant Three Gorges reservoir close to record levels. State news agency Xinhua reported on Friday that more than 10 highways in Sichuan were inaccessible as a result of flooding, and a bridge across Sichuan's Min river, a Yangtze tributary, had collapsed. Floods in the province had caused damage to the tune of about 2.4 billion yuan ($358.74 million) by Thursday, according to the Ministry of Emergency Management. Meanwhile, the nearby city of Chongqing had evacuated more than 80,000 residents by Friday, Xinhua reported. Heavy rain has also caused the Yellow River, which runs through northern China, to burst its banks, blocking a section of a railway line in the northwest province of Shaanxi. Gansu province, also in the northwest, reported 12 people killed and more than 1 million affected by a week of heavy rain and flooding, the official China Daily said on Saturday. The normally arid region of Inner Mongolia, which had suffered weeks of drought, also issued a flood warning on Friday.